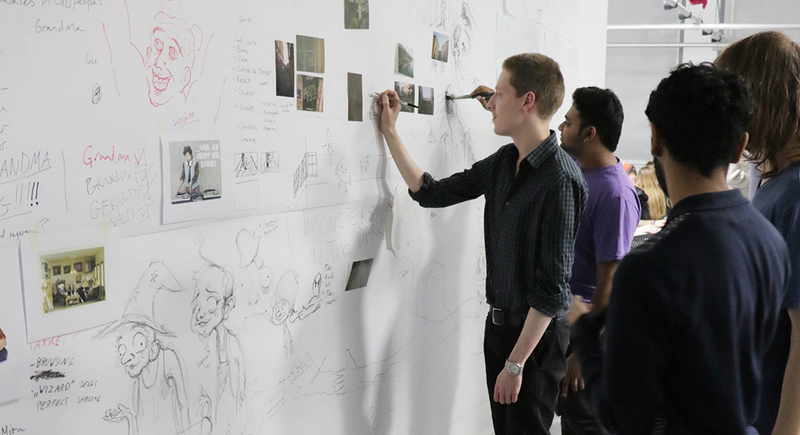 Middlesex BA Animation students working on an animation storyboard with students from the University of Applied Arts Vienna. Middlesex University has partnered with the University of Applied Arts Vienna to showcase an exclusive programme of diverse films at the Austrian Cultural Forum on 13 January. Students from Vienna have joined Middlesex BA Animation students for an interdisciplinary workshop week in London organised by Osbert Parker, Senior Lecturer in Stop-Motion Animation at Middlesex University, and Nikoloaus Jantsch from University of Applied Arts Vienna. Using swapped, unprocessed photographs taken in both cities as a starting point for visual narratives, the students worked collaboratively to produce the first of two short animated films. “Students tend to learn individually at university, but to adjust to industry they must learn to work in teams – something our students have achieved while working intensively through this international project together,” says Osbert Parker. Rhiannon Fellows, second year BA Animation student, found the collaboration extremely rewarding. “The whole experience has been great,” she says. The students used a wide range of cinematic techniques, combining powerful narratives with innovative approaches to animation. “This experience has forced me to step outside my comfort zone, to try new styles and methodologies within animation,” says Felix Weisz, animation student from the University of Applied Arts Vienna. A screening at the Austrian Cultural Forum entitled New Adventures in Animation will showcase the most exciting, engaging and emotionally powerful films from both universities. The second co-produced film will be made in Vienna with selected Middlesex University students invited to continue the collaboration at the University of Applied Arts later in the academic year.